Why All the Hate on Mighty No. 9, Y'all? Mighty No. 9 has become pretty much a joke in the online gaming community at this point. Disappointments, delays, and awful trailers have discouraged us over the past couple years, and many people are already claiming that this is a flop before its release. But why have we turned out backs on this project so quickly? This is sadly a part of our entitled culture, and we think everything needs to be done our way and be delivered to us in our time. Neither of these are realities, and neither of these create good games. This has been a huge problem for Mighty No. 9, many other Kickstarter games (e.g. Hyper Light Drifter), and even triple-A games, as many of them are being held to an impossible standard and expectation from an audience that mostly doesn’t know the [hellish] reality of game development. Mighty No. 9 and Keiji Inafune were at an extreme disadvantage right from the start. A spiritual successor to Mega Man that raised over $4 million? That sentence alone is what got critics and trolls ready to pounce on any opportunity they could upon any hiccups, mistakes, or blunders along the development trail of the game. You don’t have to look any further than Nintendo’s announcement of Metroid Prime: Federation Force last year at e3 to see just how spiteful and nasty the online community can get when they don’t get what they want. If you go to the YouTube video of the initial trailer for Federation Force, you’ll see it’s got nearly 90,000 dislikes as of this writing, and that’s before anyone has had a chance to play the game. Mighty No. 9 is in a similar boat, but in a much worse scenario. Remember how I said that critics and trolls were ready to pounce at any opportunity? Well, the first opportunity came at the first delay, which was early 2015 when Comcept announced that Mighty No. 9 wouldn’t be making its projected release date of April 2015, but given the fact that the game’s initial development was in mid-to-late 2013, an early 2015 release date was wildly unrealistic and a poor promise made by an ambitious Inafune. If this had been an 8-bit Mega Man game, he could have made this ambitious release date, but he is creating a new property, working with a lot of new people, making other games with his new company, and trying to please his investors as best he can. 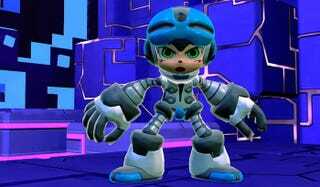 Did Inafune screw up at times, make poor promises, and even poorer decisions? Of course he did, but don’t we all? The fact of the matter is that Inafune loves video games, loves making video games, and wants to make video games that he himself wants to play. I believe in his ability to make fun games, because I enjoyed his games more than any others growing up. As someone who backed the Kickstarter for Mighty No. 9 for $99, trust me when I say that I have been quite disappointed with some of the direction that the game has gone. As an investor, part of me wants to scream at Inafune and his team all the more that they are using my money poorly or that I want a refund (Which would never happen). But I stopped myself recently, and it was right after the “Masterclass” trailer came out (You know. The one that says, “And make the bad guys cry like an anime fan on prom night.”). I realized that I am not the creator of this game, but the investor. Should an investor have a say? I think to a degree, yes, but the reality is that the vision and idea was Inafune’s, and I trusted him and his team to create a game that I really wanted to play. That’s the whole reason I threw down my $99 as quick as I did, because I really just wanted a side-scrolling action game in the vein of Mega Man. I think we need to stop judging books by their covers, which is precisely what we do too often as a community. Developers, especially indie ones, often talk about the stresses of the gaming community during development, and I think we, as the community, are to blame because we think we have more power and privilege than we actually have. Much more so than any other entertainment medium out there, video games get harsh critiques before release left and right for various things ranging from poor trailers, lack of updates, and not 60FPS to “deceivingly good” trailers, too many updates, and “looks garbage for 60FPS”. Mighty No. 9 has fallen into our tar pit of criticism and insults, and I wonder who’s to blame right now. Is Inafune and Comcept to blame for poor promises, bad decisions, and crappy trailers? Or are we to blame for holding them to an impossible standard that they were never going to reach? I honestly want to say that they are to blame, but I’m starting to think that I, and many of us, are also to blame for the judgment. However, I think the real problem is that both are to blame, and we, as the online game community, are too stubborn to admit we are wrong and just continue on the attack. Is Mighty No. 9 going to be a phenomenal game? I don’t know. I’ve only played the beta, which I rather liked, but it’s nothing to judge from. Is Inafune ever going to live this moment in his career down? Again, I don’t know, because if the game is a real success, it’ll become a milestone and not a downer. Now, is our complaining about the game doing more good or more bad for video game development in general? This is a question I’ve been wrestling with, and I’m starting to believe that our underhanded and weightless criticism are not really helping games at all. What do you all think? Are we creating too high a standard and demanding too much from the developers who are making our games? Or is our criticism too important? Let me know below! Lord Disco is a video game addict and has been playing since the ripe young age of 5-years-old. He is married to an awesome wife, has two fantastic kids (Named Logan Tiberius and JoJo), and currently lives and works in Tokyo, Japan. Not necessarily a writer by trade, but he enjoys sharing his opinions with the world, whether they like it or not. Check him out on Twitter @TheLordDisco.